Golden Boy Promotions on Monday about noon released a statement that Canelo Alvarez sustained a fracture of his right thumb during his ninth-round knockout of junior middleweight champion Liam Smith this past Saturday at AT&T Stadium in Arlington, Texas. No surgery will be required, but Alvarez’s thumb will be mobilized for six weeks. Alvarez will not be able to fight the rest of this year, though the statement indicated the prognosis for a full recovery is excellent and the injury should not prevent him from moving forward in his career. HBO on Saturday will televise a replay of this past Saturday’s junior middleweight title bout between Liam Smith of England and Canelo Alvarez of Mexico at AT&T Stadium in Arlington, Texas. Alvarez (48-1-1, 34 KOs) decked Smith (23-1-1) three times on his way to a ninth-round knockout, Alvarez taking Smith’s title. The Golden Boy Promotions card was televised live on HBO pay-per-view. 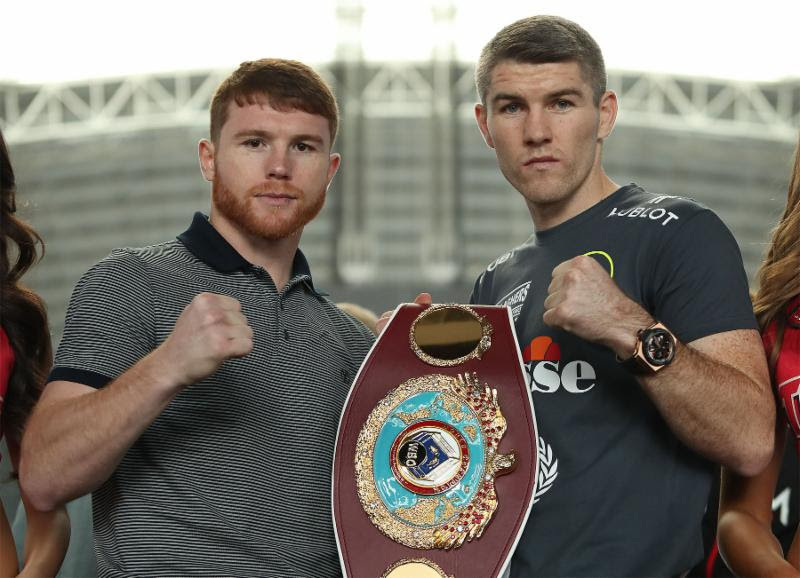 Junior middleweight champion Liam Smith of England and challenger Canelo Alvarez of Mexico successfully made weight Friday for their showdown Saturday at AT&T Stadium in Arlington, Texas (on HBO pay-per-view, $54.99, $64.99 HD). Smith and Alvarez both tipped the scales at the limit of 154 pounds. Smith, 28, is 23-0-1 with 13 knockouts. This will be his third defense. Alvarez, 26, is 47-1-1 with 33 knockouts. Alvarez has held titles at this weight and at middleweight. Promoter Frank Warren is pumped up about his fighter, Liam Smith, getting a chance to defend his title Saturday against Canelo Alvarez (47-1-1, 33 KOs) of Mexico at AT&T Stadium in Arlington, Texas (on HBO pay-per-view). Smith (23-0-1, 13 KOs) has never fought in the States, so he’s unknown to most here. Warren promised this week American fans will jump on Smith’s bandwagon once they’ve seen him fight. That’s all well and good. But the eight consecutive knockouts haven’t exactly come against top-notch competition. Check out Smith’s ring record and judge for yourself. Liam Smith is a junior middleweight world champion, which means he has – to a degree – reached the promised land in boxing. The thing is he hasn’t beaten any real outstanding fighters, so he is not yet a star. He would be if he were to successfully defend his title Saturday against Canelo Alvarez of Mexico at AT&T Stadium in Arlington, Texas (on HBO pay-per-view). “Canelo is an elite fighter, and this is my chance to go up the ladder,” Smith said at Thursday’s final news conference. Alvarez, who has been highly criticized for not fighting middleweight champion Gennady Golovkin, swears he’s taking Smith seriously. Smith, of England, is 23-0-1 with 13 knockouts. Alvarez is 47-1-1 with 33 knockouts. For those mulling over whether to purchase Saturday’s HBO pay-per-view feed for the junior middleweight title bout between champion Liam Smith and Canelo Alvarez, it won’t come cheaply. We’re talking $54.99, $64.99 for high definition. Golden Boy Promotions will also offer the feed on live stream for $64.99. That address is www.goldenboyppv.com. Alvarez, of Mexico, is 47-1-1 with 33 knockouts. Smith, of England, is 23-0-1 with 13 knockouts. They will tangle at AT&T Stadium in Arlington, Texas. they square off Saturday at AT&T Stadium in Arlington, Texas (on HBO pay-per-view). But Smith (23-0-1, 14 KOs) this week suggested he’s no Amir Khan, his countryman who was knocked out by Alvarez in the sixth round in May in Las Vegas. in the ring, I will not fail to do. I have my own skill set that I can excel in. Khan moved and out-boxed Alvarez for five rounds, then Alvarez lowered the boom on him. Trainer Joe Gallagher thinks a lot of his fighter, Liam Smith, and Gallagher on Tuesday gave notice to the boxing world that Smith (23-0-1, 13 KOs) will be able to give Canelo Alvarez (47-1-1, 33 KOs) all he wants when they square off Saturday for Smith’s junior middleweight world title at AT&T Stadium in Arlington, Texas (on HBO pay-per-view).